Ann was born, raised and educated in Toronto before moving to Ottawa to work at the National Gallery. There her boss encouraged her to take photographs of local eyesores to gain experience and learn by doing. She later bought her own Nikon camera and took photography courses. 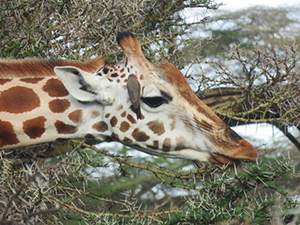 Ann travels extensively, and always has her favourite Canon PowerShot cameras with her: one an 18 times zoom lens, and the other with a 30 times zoom. Both of these have been used for her show entitled Point and Shoot, her preferred method of working. When Ann retired, she moved permanently to Grand Manan (having been a summer resident for a number of years). She says moving here was the best decision she has made. David was born in Cornwall, Ontario, and spent his career in forestry working across Canada and the northeastern United States. He finished his career teaching forestry in Fredericton, NB, where he now resides. During the 1980s, David carved and painted working and decorative duck decoys, and he also did some carvings in stone. Many of his decoys are with collectors across North America. He began painting in 2003, but it was not until 2010 that he began spending a fair portion of his free time in this pursuit. With the exception of a two year hiatus, he has been painting almost full time since retiring in 2013. Dawn is a self taught First Nations Artist, born in Yellowknife, North West Territories. She is a direct descendant of Chief Snuff of the Yellow Knifes, one of the signers of the original Treaty 8 with the Government of Canada. Dawn’s work is characterized by vibrant colours and a playful spirit. She has devoted herself to painting full time, and she opened her first gallery in Yellowknife in 1999. There have been many highlights in Dawn’s career. She designed the corporate logo for Canadian North Airlines, and in 2003, the Royal Canadian Mint chose one of her designs for the Festivals of Canada series fifty cent coin collection. Four of Dawn’s designs were selected for the UNICEF International Card program. 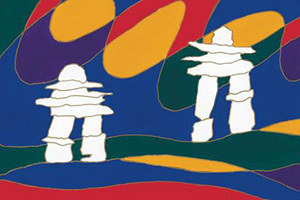 Dawn was the first female Canadian Native Artist to design the poster for the International Standards Organization. The Vatican chose her art for one of their official Christmas cards. The Coca Cola Company commissioned Dawn to paint one of their six foot bottles that were displayed at various locations throughout the grounds of the 2010 Vancouver Winter Olympics. The Canadian Consulate General chose Dawn’s work to be on their 2016 Christmas card. Dawn is also proud to be a licensed artist with Canadian producers such as Kanata Blankets, Oscardo, and Canadian Art Prints. In 2010 Dawn moved to the Annapolis Valley in Nova Scotia where she opened her gallery in Annapolis Royal. In 2012, due to her husband’s failing health she was forced to close her popular Annapolis Royal Gallery to care for him. At this time she moved her gallery into her home studio. Dawn has now opened her new Dawn Oman Art Gallery in a decommissioned United Church building in Bridgetown, NS. The church’s stained glass windows, and Dawn’s vibrant artwork compliment each other beautifully, and there is an intimate concert facility in the former sanctuary. Further renovations will provide vacation rental accommodations, or accommodations for recording artists who wish to utilize the fabulous acoustics of the sanctuary. John Draper is a photographer living in Fredericton, New Brunswick. His background is in traditional photography and darkroom work. Before branching out on his own, John spent time as a printer in a professional photo lab, as well as working as a photographer for several companies. Several years ago John discovered the joys of the digital world. He graduated from the Digital Communications program at NBCC and was then a founding partner of The Pixel Factory which for several years was the poster child for NB’s fledgling high tech industry. John’s aim is to provide the best possible service to his clients. Sometimes that means a straight forward photo shoot, and at other times it involves digital manipulation of images to produce the best possible effect. 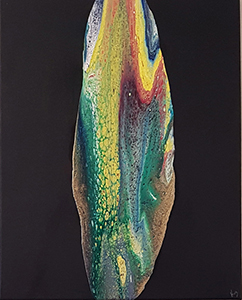 Karena Graca and Brian Rimpilainen of Twist of Fate Artistic Design create what they call “cosmic paintings.” These unique acrylic paintings are created by mixing several additives into different colours of acrylic paints. The paints are then layered and poured onto the canvas. As soon as they hit the canvas, the paint is very carefully “boiled” using a handheld blow torch. The boiling brings out small bursts of the colour beneath, creating this cosmic appearance. Once dried, the paintings are coated in polyurethane so they are safe to hang in a humid environment like the bathroom or kitchen. The entire process takes five days. Karena and Brian also do carved vinyl records. The piece consists of a sandwich of two records. The top record which has been hand carved is attached to the bottom record which has been painted using the cosmic technique. The painting on the bottom record shows through where the top record has been carved. Ktee Brown is originally from the west coast of British Columbia. When she was 20 she took some instruction in drawing and stained glass making at the Northwest Community Art School in Seattle Washington. Raising two children kept her busy, but she always found time to paint some watercolour pieces. In the 1980s she was working full time as a child and family counsellor, but she still managed to take some instruction in painting with acrylics. Ktee developed major health issues, and has been on long term disability since 1996. By 2008 her children were on their own, and she had more time to devote to painting. In 2010 she had her first show at a locally eatery, and later painted for group shows and film festival events. Ktee moved to Moncton in 2011, and now calls New Brunswick home. 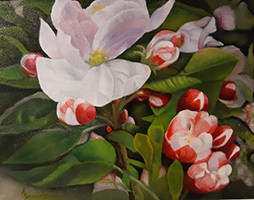 She continued painting, and in 2013 she participated in a group show at Art in the Garden Cornhill, and in 2018 she had a show at the Moncton LIbrary. 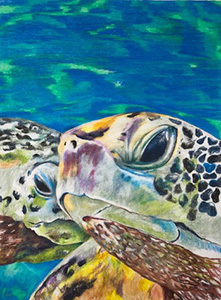 One of her paintings was recently chosen by the Town of Riverview to be displayed in the Council Chambers at City Hall. Lisa Martin lives in Amherst, Nova Scotia, and her specialty is fossil glass. In nature, fossils take millions of years to form under very specific conditions, including extreme heat. This causes plant life to carbonise and become fossils. Lisa mimics this process using a kiln. Using a firing process that lasts over 20 hours, Lisa turns plants unique to her area to carbon, and seals them in glass forever. Her business is called Jeremiah Tree Fossil Glass. The Jeremiah Tree never stops growing, producing fruit, and it doesn’t fear drought. A tree planted in Lisa’s front yard the year her son Jeremiah was born, is nicknamed the Jeremiah Tree. 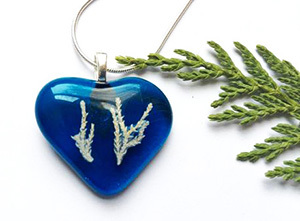 Like the Jeremiah Tree, the pieces of tree fossilized within the glass jewellery she creates will go on forever. The Pal-ettes are close friends with a passion for art. They live in Fredericton, and they meet regularly to paint, drink wine, and discuss the world’s problems. Each member of this talented group has a unique style. 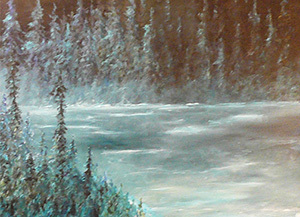 Debb Ferris Bates is a New Brunswick artist living in Fredericton, which has been her home for many years. 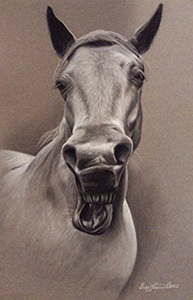 Debb’s work exhibits a touch of realism as she captures likenesses and expressions of the people and animals she portrays. She works in oils but recently has begun exploring graphite, charcoal, and pastels. Debb’s years of experience as a sign painter has given her the skills, confidence, and dexterity which she now brings to fine art. Her goal is not only to capture the appearance of her subjects, but to further show their true essence. She is inspired by the people and animals she encounters in daily life. She approaches her subjects with the hope of captivating her viewers and leaving them optimistic. Francine Voisine has lived most of her life in Fredericton, and it is in this place where her creativity has flourished. As far back as she can recall she has always enjoyed scribbling, colouring and painting, and this love is reflected in all of her art. 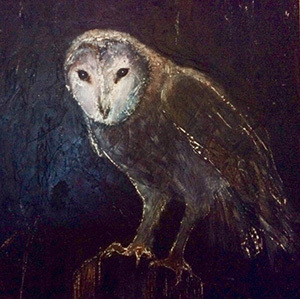 She works with various mediums including oils, acrylics, and watercolours, and more recently has experimented with eco printing. 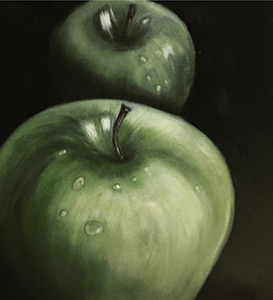 Mostly self taught, Francine has studied under Glenn Priestley, and attended many workshops with professional artists who have guided her along the way. She is inspired by the beauty that Mother Nature has bestowed upon us. Her flowers, landscapes, and animals which she brings to life on canvas, all illustrate the natural colours and beauty our world has to offer. Because her subject matter is so diverse, it’s always a challenge to choose just one to portray. She’s hoping that those who view this body of work will appreciate the splendour that exists around us, and perhaps will literally take the time to “Stop and Smell the Roses”. 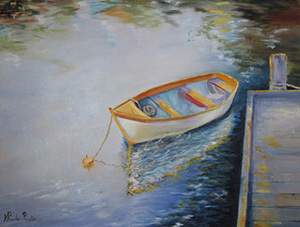 Francine is a member of the Fredericton Society of Artists,Turps, Art Club, and Seniors Group which has given her numerous opportunities to exhibit her work. Géraldine Poirier Baiani was born and raised in Moncton. She worked in Saint John and Moncton, and moved to Fredericton in 2007 to work as a senior executive with the provincial government. She would have loved to study art after graduation, but she went to University and became a social worker, wife, and mother. Painting wasn’t a priority, but she had the best looking flip charts in the office, and despite taking a variety of art classes over the years, she wasn’t able to practice consistently. She took her first oil painting class when she retired in 2013, and fell in love with the medium. She enjoys the fluidity and the sharpness of the colour. She now paints as much as she can, some weeks almost every day. She never planned to produce art about one subject or another. She is constantly looking for the beauty in everyday things around her. She paints a lot of portraits, dancers and girl things like shoes. Being the mother of two wonderful women who did ballet obviously influences her choices. She works mostly in oils, although she has also done acrylics, pastels, black ink and watercolours. Capturing the light and the essence of the person is everything for her. She doesn’t want to simply reproduce an image, she wants to give it much more. She loves how a simple drawing transforms in a matter of minutes as you add paint or glaze. Marie-Paule Paulin is originally from Shippagan New Brunswick, and has been living in Fredericton since 1972 where she had a career as a teacher. From a very young age she was always attracted to different kinds of artistic expressions. She loves visiting art galleries, spending hours admiring the work of different artists. Once she retired, her passion for art led her to follow her dreams, and consequently, she registered for classes in painting and drawing. She has discovered that self-learning and experimentation work well for her as she continuously strives to grow in her field. Almost every day, she pursues her art with enthusiasm and dedication as she paints or plans new material. Ruby Allan currently resides in Fredericton. She has spent years in New Brunswick finessing her craft and exploring her art. She is mostly self taught, but has studied under the Canadian artist Glenn Priestley for five years. Ruby works in a number of mediums including oils and acrylics, and more recently has revisted her love for drawing with coloured pencils. After attending the Kingsbrae International Residence for the Arts for one month in 2017, and her second Art Residency at Sherbrooke Village, Nova Scotia in 2018, she has honed her skills, and has committed to coloured pencils as her primary medium. Through her art she aims to capture the beauty of seemingly ordinary objects and places. She finds inspiration in her surroundings, and is constantly searching for a new perspective with her subject matter. Striving to think outside the box has lead her to become a successful artist, and to pursue her passion. For this series of underwater creatures and their environment, Ruby was motivated by the colour and shapes submerged at the bottom of the sea. She hopes that the viewer will embrace the hidden beauty this great world of ours has to offer. Wendy has worked for over 35 years in senior management roles developing business plans and marketing strategies for a diversity of organizations in the public and private sectors including information technology, telecommunications and publishing and broadcasting. In more recent years she applied her business acumen and creative eye to the performing arts sector where she managed the marketing and fund development teams for the Imperial Theatre in Saint John, New Brunswick. She was also part of the programming committee for the selection of performances, as well as the exhibition committee that oversaw the selection of work by visual artists for display in the gallery space. 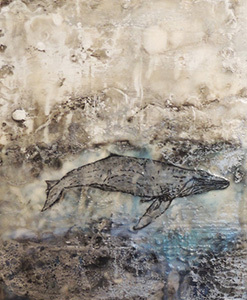 Wendy’s exhibit, Mixed Media Messages, is comprised of older work and a more recent foray into encaustic painting. The intention is twofold; to bring the outside world in by giving new form to bits and pieces of nature collected along the way, and to bring the inner world out by making visible archetypal images that are imprinted in us individually, and collectively as a species.